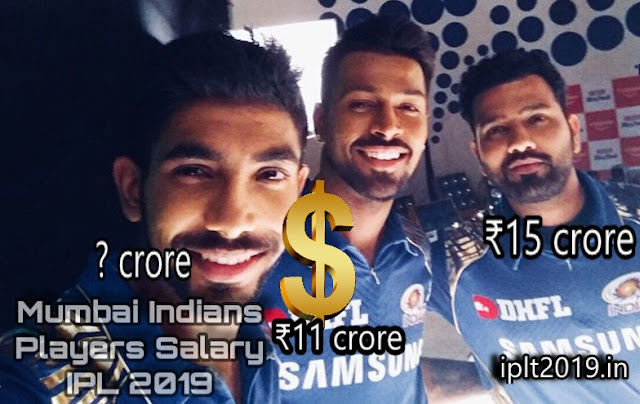 Here take a look on the complete list of Mumbai Indians players salary in IPL 2019. Salary of the players who are retained by Mumbai Indians. Scroll below for salary of Mumbai Indians Players in IPL 2019. Mumbai Indians have won the trophy three times. They are also a strong contender of IPL 2019. And in we look at stats, MI has won the trophy in 2013, 2015 and 2017, you know what I mean, next comes 2019. What do think about that? They have one of the best bowlers of the Indian team that is Bumrah, who is on top of Indian Bowlers at present. Last year in IPL 2019, he took 17 wickets in 14 matches with the economy rate of just 6.88. This trio of three players Jaspreet Bumrah, Rohit Sharma and Hardik Pandya will be a lethal combination. Suryakumar Yadav's batting and Hardik Pandya's bowling were two big plus point for Mumbai Indians in the last season of IPL 2018. Suryakumar Yadav was the highest run scorer for the Mumbai Indians in IPL 2018. Now we are seeing that Rohit Sharma is also in good form. Rohit Sharma is the highest paid player of Mumbai Indians in IPL 2019 receiving 15 crores (USD 2.1 million). Hardik Pandya is second in the highest salary list of Mumbai Indians players salary in IPL 2019. Mumbai Indians have retained 17 players in IPL 2019. They announced the list before 15th November. They released 10 players before the IPL 2019 Auction which is going to be held on 18th December 2019. So the salary of Mumbai Indians Players in IPL 2019 will be given below. So that is the whole list of the salary of Mumbai Indians Players in IPL 2019 who are retained by Mumbai Indians. Others players salary of Mumbai Indians will be updated as soon as it will be announced by the franchise.